Whenever you are working with large equipment, or working from a height, there will be additional safety considerations. When the job site demands the use of a lift or boom, it presents unique safety concerns for everyone. Anytime someone is working at a height, like on scaffolding for instance, everyone needs to be alert to the risk of falls and falling materials. The equipment used to help workers reach those heights needs to be considered as well. 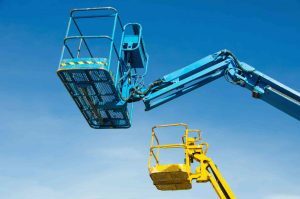 Here are a few ways to keep everyone safe when working with lifts and booms. The first step to keeping everyone safe around lifts and booms is to ensure each and every person is properly trained. This includes not just operators and foremen, but any other worker on the jobsite that may interact with the equipment. The best way to keep workers safe when working on, about or around lifts and booms is to make sure that all the equipment is in working order. You do not want to deal with a maintenance issue while a worker is in a basket or elevating equipment. Lifts and booms will be equipped with hydraulic, mechanical or electrical safety devices that should not be tampered with or overridden. These devices are put in place by manufacturers to ensure correct operation, and altering them could result in a dangerous work environment. Any worker who will be working from a basket should be outfitted with a body harness and personal fall arrest system. Always remember to chock wheels and set brakes when working on any type of slope. This entry was posted on Friday, September 30th, 2016	at 2:27 pm	. Both comments and pings are currently closed.